At the first stage of the life of the project it was decided to fully replicate the functionality of the classic data collection terminals. Describe the data collection terminal. 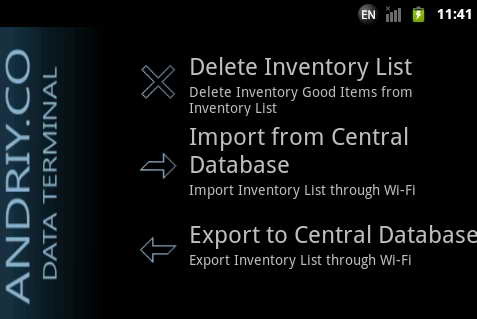 Download directory of products with names, prices and bar codes into the terminal of data collection. Inventory. 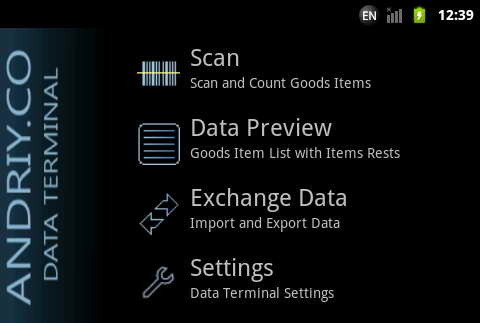 Usually, an automatic selection of goods from the directory of the scanned bar code, counting the actual number of goods and putting this amount into the terminal. Repeat steps many times as necessary. Unloading counted cash balances into a computer for further processing. Usually remains delivered to your system as a result of stocktaking. 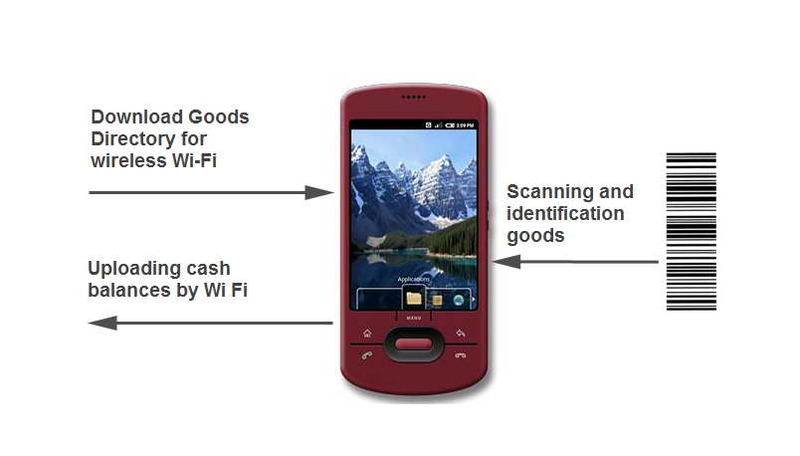 Data collection terminal - device is not cheap Traditionally - a PDA on the Windows platform Mobile in shock-resistant casing, combined with a barcode scanner. Such a device is irreplaceable for the work on large warehouses in adverse conditions. And its price for these tasks seems quite justified. But what about small and medium-sized shops, to which the price in 1500 - 2500 dollars for a single device is unaffordable? At one time, a good solution was CipherLab 8001. But at the moment it is virtually impossible to find. Basic and important question - how will be reading the bar code using a conventional phone-based Google Android? The phone has a camera. 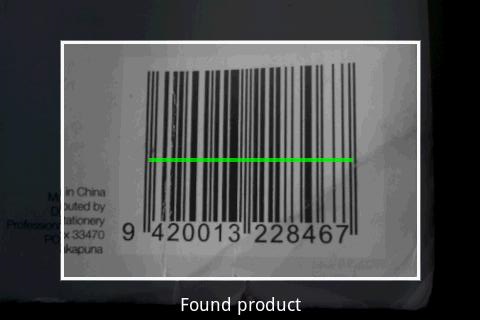 Its resolution and sensitivity is sufficient for normal barcode in normal lighting conditions. Experience showed that the barcode is almost instantly and their identification is straightforward. You can talk about safe operation of industrial semi-skilled personnel. We now describe the application itself. We need to get into the terminal directory products. Press the menu item "Communication». Before loading the data into the terminal, you need to clean up existing data. This step is provided as protection of existing data from accidental rubbing. If the directory contains product information, download the new data will be impossible. So, we spend cleaning of old data. 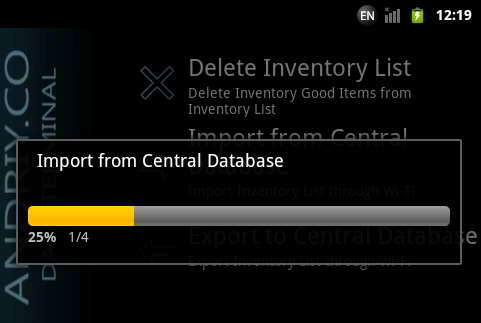 Once the old directory products will be cleaned, you can start downloading the new directory. 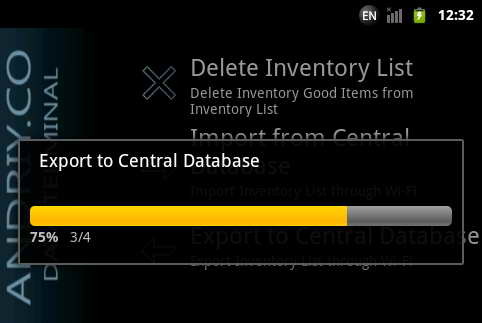 After loading the data produced, will return to the main menu by pressing the button on the body of the CCP. In the main menu, select "Scan». Enter the desired quantity of goods taken account of. Convenient to use the + and - buttons to adjust the number. If goods have met before, then the amount that will be added. After clicking on the "Apply" button, we will automatically proceed to scan the next item, etc. When you need to return to the main menu, just press the reset button panel PDAs. This product can be selected not only for the bar code, but also from the list. Select "View Data". This opens a list of products. By clicking on any product will be selected card product. 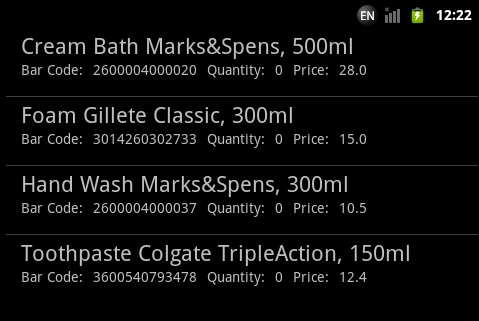 Thus, we can select products not only scanning the bar code, but a simple choice from the list. This opens the search bar. We introduce there, for example, part of the bar code "501132" and click "Search" next to the text. The result will see a list of products that have a bar code is present, this sequence. Further, if we need to change the number - are acting as usual. 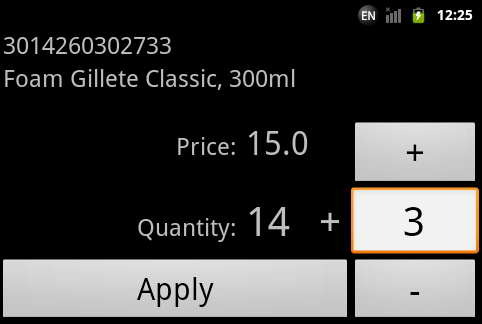 Simple click on the item in the list, open the card and enter the product number. After that click "Apply». After entering data into the terminal is completed, open the main menu "Communication" and make the export data from the terminal. At this cycle of terminal can be considered complete. 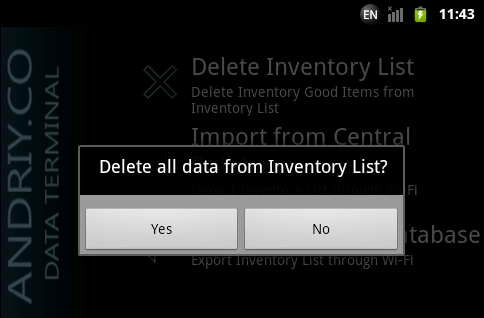 Next article will focus on the interaction of the application data collection terminal and a computer. We describe how data is exchanged, where the data comes into the terminal, and where the terminal unloads calculated amount. We also show how to organize the interaction of the terminal collecting data from the TCU, or any other accounting system. Note: This article was obtained through a machine translation. We would appreciate any comments.